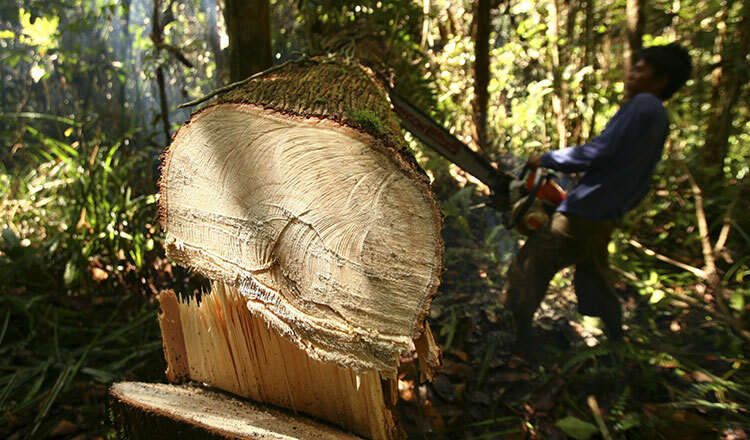 Illegal logging is a global problem, especially acute in developing tropical nations. It is exacerbating climate change and biodiversity loss, driving conflicts with traditional landowners, and funnelling money into a variety of other criminal enterprises such as the illegal drug trade and human trafficking. The European Union wants to facilitate the export of tropical timber from Vietnam to Europe. This forest law agreement already signed by EU and Vietnamese officials is known as the “Forest Law Enforcement, Governance and Trade Pact”. This agreement would theoretically ensure that all the wood exported from Vietnam to the EU has been legally felled. But many reports provide clear indications that Vietnamese companies have been shelling out millions in bribes for logs cut from national parks and community areas in Cambodia. Despite a ban on the export of timber to Vietnam that came into effect at the beginning of 2016, in the year following the Cambodian government’s decision, according to conflicting sources, 300,000 cubic metres of wood were illegally cut in Cambodia and then smuggled into Vietnam. Vietnamese politicians or senior civil servants sell official “import quotas” to timber traffickers and levy taxes on them. Illegal timber from Cambodia have thus been declared legal in Vietnam. These quotas have incentivized and facilitated illegal logging on a massive scale in Cambodia at a time when its government is seeking to stop all timber trade with Vietnam. Vietnam has experienced a resurgence in forest cover over the past 20 years, largely as a result of forestry policies that restrict timber harvesting and encourage the development of processing industries that turn log imports into finished products for export. But the environmental benefit of the increase in Vietnam’s forest cover is deceptive: it comes at the expense of forests in Laos, Cambodia, and Indonesia. Patrick Meyfroidt and Eric F Lambin of the Université Catholique de Louvain-la-Neuve in Belgium calculated that an equivalent of 39 percent of Vietnam’s forest regrowth between 1987 and 2006 was effectively logged in other countries. According to their analysis, half of the wood imports into Vietnam during that period were illegal. “Vietnam protected its forests and developed its economy by exporting its deforestation to neighbouring countries,” the authors write, noting that the apparent “leakage” – an increase in deforestation in one region caused by reduction of deforestation in another – is “a major challenge in policies aimed at protecting forests and mitigating carbon emissions”. Under the agreement with the EU, Vietnamese authorities will issue certificates certifying that this timber has been legally cut. Wood from depredation will then be granted a label allowing it to be freely exported to the EU. Blatantly, through this agreement with Vietnam, the EU will contribute to the looting of forests still existing in Cambodia and in particular those national parks that are targeted by Vietnamese looters. Clearly, Cambodia’s efforts to stop deforestation have been undermined by Vietnam issuing quotas that turn this illegally cut and laundered wood into “legal” timber, with the EU as a willing partner in the agreement. This is sheer hypocrisy on the part of the EU that has rapped Cambodia’s knuckles hard with the withdrawal of its trade privileges under the Everything But Arms scheme. They are hitting us hard on the trade front by waving the banner of human rights but behind our backs they are conniving with Vietnam to legalise the theft of our timber. Deforestation is a problem that not only affects all of Asia but impacts the entire planet with climate change and biodiversity loss. Europe, too, will be affected. Climate change would be made worse by chopping down trees. It also intensifies droughts and floods, exacerbates food security, and threatens the very existence of humans. There is an urgent need to put an end everywhere to the looting of the heritage of humanity represented by forests. Raoul M Jennar is a political scientist based in Cambodia.